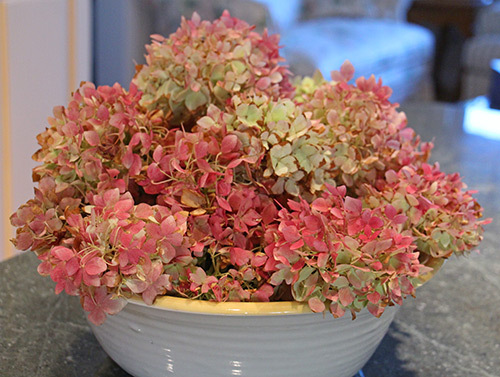 Here’s a picture of some fall hydrangea blossoms. I cut them to bring in before a much-needed rainstorm here in northern CA. If all goes well, my plan is to put samples back up for sale late next week and bottles the following week. I’ll post again next week about that. Still working on the Amber Incense. I’m trying some beta damascone in it and really like it, but I’ll need to get the natural isolate version since I want to keep this formula all natural. I wanted to give an update on my plans for the shopping cart — I would like to put it up before the end of October. I know that’s not very specific, but I’ll give more updates as I go. We have family visiting both next week and the following week, and I have a number of other personal things going on. (The dishwasher just died and needs to be replaced, and my health plan was just canceled and I need to research the other options and join a new plan, and there are several other even more boring things to take care of, lol.) It will be hard to accomplish anything once I put the cart up, so I’m trying to finish as much as I can first. I’m also working on the new Amber Incense. I’m working on scaling up the formula, and I need to send out some more testers. We are also still batching the regular scents to build up more stock.